Greg Gabriel: Time For A QB Change? Is It Time for a Quarterback Change in Buffalo? The 2017 football season for the Buffalo Bills looked so promising, with the Bills getting off to a 5-2 start in their first seven games. That has come to halt with the Bills getting blown out two games in a row. Last week it was on the road and yesterday we saw the Bills get demolished at home 47-10, one of the worst home defeats in Bills history. Why has this happened? When you go back and watch tape, we see the Bills were winning early because of outstanding coaching and excellent effort, aggressiveness and enthusiasm by the players. The problem is these players have limitations and in the NFL, your opponents are able to expose and attack those limitations. That is exactly what has happened in the last two games and I don’t really know if we are going to see an end of it. The Bills schedule the next few weeks is difficult. They have to travel to Los Angeles next week to play the Chargers and that is followed up with a game at Kansas City. After that the Patriots come to town. The Bills will be lucky if they go 1-2 over that span. In the last two weeks, the defense has just gotten overpowered at the point of attack. New Orleans having the ball for over 41 minutes and rushing the ball for almost 300 yards bears that out. On offense, much of the poor play goes directly on the shoulders of quarterback Tyrod Taylor. I have been saying since the preseason that Tyrod has limitations that he will never be able to overcome. The easiest way to beat the Bills is force Taylor to stay in the pocket and make him throw. That is what the Jets and Saints did very effectively. Taylor is a short quarterback who plays shorter than he measures. He is not a quick processor on the field and is very slow to go through a progression and get the ball out of his hands. When he does throw from the pocket, his accuracy and ball placement is very average. He is more comfortable throwing to a check down than finding an open wide receiver and that is the reason for the poor production by the wide receiver corps. Yesterday when the game was out of reach, Sean McDermott put in rookie Nate Peterman and the difference in play was dramatic. Peterman is very decisive with his decision making, has a very quick release and is accurate. In his ten throws yesterday there was one off target throw and that wasn’t by much. He also targeted the wide receivers more in two series than Taylor did in the whole game. Peterman completed 7 of 10 throws for 79 yards and a touchdown. In his limited action he never once made a poor decision. I did a lot of work on Peterman in college and I believed then and I still believe that he can be a winning NFL quarterback. To me, he has talent similar to Kirk Cousins when he came out of Michigan State. All Peterman needs is time and experience. That being said, I doubt McDermott will make the change just yet. He feels that with Peterman being a rookie, his chances of winning and getting the Bills to the playoffs is limited. For that reason, he will stick with Taylor at least one more week. If Taylor plays poorly at Los Angeles next week we could see Peterman the following week. My guess is that by no later than the Colts game on December 10th, Peterman will become the starter. That gives the Bills four full games to figure out what they have in Peterman. Something they must know before they go into the off season. I understand McDermott’s thinking. He feels that a veteran quarterback gives the Bills the best chance to win. I disagree and mainly because we have seen over the last few seasons that young quarterbacks can come into the league and win. Peterman is smart, instinctive and a leader. 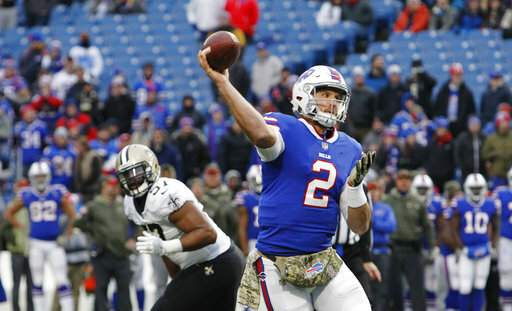 He has upside and right now in Buffalo, Nate Peterman gives the Buffalo Bills the best chance to win and get to the Playoffs. For more of Greg Gabriel’s expertise and opinions based on 30 years in the NFL, become a BSP Pro member and get acess to all of his work. I think we have seen TT’s ceiling. TIme to move on before this once promising season is lost. But, we’re not the HC, and I bet he stays with TT until playoffs are all but gone.